I love to sing dance and just be a child at heart so I love this CD. It is simply wonderful because it has songs for kids of all ages. It has songs that had me wanting to get up, dance, sing and have fun and I found myself doing just that. I love that Raffi sings songs that are fun and memorable and just plain silly! Included are 16 unique songs kids can dance, sing, learn and just have a good time along with Raffi. This would be great for parties or sleepovers and will pick you up if you are feeling blue. They are very kid-friendly and teach lessons such as everyone grows up, what the sun is and what it does best. On the flip side, there are songs that are funny and silly and will have you up out of your seat and whirling around your house. The Wheels on the Bus and If You're Happy and You Know It are classics that have a few twists added which make them even cuter. My favorites are Baby Beluga and Love Bug. I love these two because they are very sweet and very clever and had me laughing and dancing. The Baby Beluga is about a baby beluga's day and what it did. Love Bug is about the love bug and how everyone has one and how it shares love and happiness throughout the world. This CD really made me feel like I was 5 or 6 again and I loved it. It really lets you be carefree and silly and not have to worry about things that older kids have to worry about. For example, things that really bothers me is that I have to do school, worry about money, boys and report cards and what my parents think of me. When I listen to this music I let all that stress go and kicked back to relax and just have fun and go back to that time of my life when I had no worries, bills or strife. I think that it could really help kids deal with all kinds of things and bring them a bit of joy to their day. I recommend this for kids ages 2 to 12. 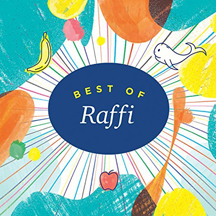 Kids will love how Raffi sings songs that are fun and educational. They are easy to follow and invite the listeners to sing and dance along. I give this CD 5 out of 5 singing and dancing stars shooting across the sky. This CD is a mixture of new and old children's songs. Many of the old songs are favorites and the children got up and danced and sang along to them. Some of the newer or, not so familiar songs, are upbeat and exciting. The first half of the CD are fun, fast paced and kids loved them and danced along. Some of the slower paced ones did not hold my grandchildren's interest as much. An old favorite, "The Wheels on the Bus" was their favorite. Also a new version of De O, Daylight Come and Me Wanna Go Home is delightful. They know the words to this song and clapped their hands and danced along. They also were quite partial to "Down By the Bay," "Apples & Bananas," "Ring, Ring Banana Phone," "Let's Play" and "Shake the Sillies Out." My kids loved the faster paced songs. I need not remind you that Raffi came to prominence in the Plasticine Period when most children's music was seeking its way in the woolly wilderness - most things were molded in brightly colored clay and deemed most precious. And then, this clarion voice came shining through the stark wilderness, broke the mold and boldly mixed traditional songs in clever ways and wrote original insightful songs of social relevance with love and gentle understanding of his young adoring audience. Somewhere in a faraway distant galaxy little Xnobian children are pointing their antennas toward the Milky Way and receiving the first faint notes of "Baby Beluga". What a treat. Listen and smile and applaud 40 years of this true artist for the ages! This CD has terrific performances, songwriting and production qualities. Raffi's songs are extremely well crafted and provide a relevant message for kids today just as they did when he started out. They are aimed directly with love at their core audience of children from toddlers to 8-year-olds. They model behaviors of love, acceptance, protection and fun! This artist is totally in touch with his audience and the importance of the world in which they live. With its beautiful arrangements and vocal prowess, it provides an absolute learning adventure odyssey. Let's all get involved in saving the Earth for future kids and protecting the innocent. This is a must get for parents of young ones. Reviewed by John Wood, KIDS FIRST! Music Juror. A career-spanning collection, celebrating 40 years of hits from the legendary children's troubadour Raffi. The album includes 16 classics including "Down By The Bay" (1976), "Bananaphone" (1994) and, perhaps his most iconic hit, "Baby Beluga" (1980). Beginning with 1976's Singable Songs For The Very Young, pioneering troubadour Raffi Cavoukian (better known simply as "Raffi") is one of the world's best-selling and most influential children's entertainers.